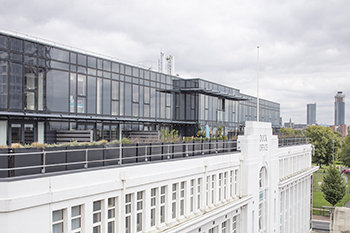 A residential refurbishment of the 1920s Dock Office in Salford Quays has included a two-storey steel framed structure at roof level, incorporating TECHNAL MX Toggle curtain walling and FY65 windows, fabricated by Quest Solutions (UK) Ltd. The re-development by Liveman Properties has converted the Dock Office into a mixture of one, two and three bedroom apartments, with an additional 14 new duplex apartments constructed on the existing building roof. DV Architects, Liverpool, specified Technal’s MX Toggle Glazing curtain walling for the steel frame extension and Technal FY65 windows. Architect Billy Hodge said: “The Dock Office is a local heritage asset and great care has been taken to make sure that the character of the building is not altered. Technal’s MX Toggle curtain walling allows for the creation of a flush glass façade, which, in addition, can be either concave or convex. The double-glazed units are fixed to the transom and mullion profiles through a specially designed, thermally broken toggle to allow quick and easy installation.